7/26 Cup of Coffee: It was a day of matinees, as Pawtucket and Lowell were the only affiliates to start play after 6 p.m. It was also a day of twin bills, with both DSL squads and Greenville playing two. Portland blew a three-run lead in the ninth, but Tyler Dearden (pictured, left) hit two home runs and Brett Netzer and Ceddeane Rafaela had four hits for Salem and the first DSL squad, respectively, while Denyi Reyes pitched a complete game in Greenville. Josh A. Smith gave the PawSox five one-run innings, but the Clippers scored twice in the eighth to take the win. Sam Travis had the lone RBI and Mike Miller added two base knocks. It was Fernando Rodriguez, Jr. who allowed the game-winning runs on two hits across a pair of frames. Teddy Stankiewicz rolled through seven innings, allowing only an unearned run on five hits to go along with four strikeouts to seemingly lead Portland to victory but Jordan Weems blew a three-run lead in the final inning. Harrisburg scored four in the 10th to seal the victory, despite three Portland runs in the bottom half. 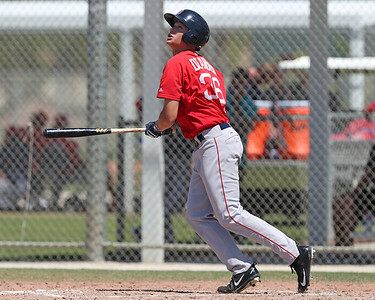 Michael Chavis led the way with the bats, going 1 for 3 with a two-run home run. He was one of three Sea Dogs with multiple hits, including Danny Mars, Jantzen Witte, Jordan Betts, Deiner Lopez, Nick Lovullo and Jhon Nunez. Brett Netzer had four base knocks as part of a 12-hit afternoon for Salem, but a rough day on the mound saw the Red Sox lose their eighth game in 11 tries. Jerry Downs doubled in the ninth to put two in scoring position with one out, but they could not close a deficit that was made much larger after a three-run eighth for Wilmington. Jake Cosart had a shutout seventh but could not do the same in that eighth inning, allowing three runs on five hits. The Blue Rocks had another big inning in the fourth off of starter Daniel Gonzalez, who surrendered one hit but walked five in 3 2/3 innings, leading to five runs crossing the plate. Denyi Reyes pitched all seven frames for Greenville in the first half of a doubleheader, striking out eight against zero walks. He allowed just three hits and his only mistake was a home run in the fifth inning. Everlouis Lozada carried the weight offensively with two RBI. Pedro Castellanos and Zach Sterry each had two hits. Things did not go nearly as well for Greenville in the evening session as Hickory used two big innings to dominate. Angel Padron's start was over after 3 2/3 innings in the midst of the Crawdad's three-run fourth. He allowed three runs on four hits and struggled with his control, walking four batters. Greenville notched only five hits, three of which were by Kervin Suarez. Lowell pounded out 11 hits but it was not enough to top Hudson Valley's impressive offensive effort. Yorvin Pantoja had a shaky start, as he allowed seven runs on five hits with four walks mixed in across 3 1/3 innings. Kevin Biondic did not do much better, as three runs were charged to his tab in 1 2/3 relief frames. A trio of Tanner Raiburn, Victor Garcia, and Danny Bethea pitched four scoreless to end the ballgame, but the offense could not complete a comeback. Tyler Dearden had three hits, driving home three runs on two homers, while Alan Marrero also went yard. Jonathan Diaz had three hits as the Red Sox scored one in the bottom of the ninth to send it to extras and then struck again in the 10th to win it. Juan Carlos Abreu drove in the game-winning run as part of a 2-for-5 day, joining Carlos Pulido as hitters with multi-hit games. Yasel Santana pitched five innings, allowing three runs on five hits. He walked one and struck out seven. Yoan Aybar and Andres Jiminez each threw two no-hit frames to complete the ballgame, with Jiminez' outing being perfect. Cristofe Tineo gave the Red Sox four three-hit, shutout frames to begin the morning, but it was for naught as his offense could not hold up their end of the bargain. He struck out four, walked two and lowered his ERA to 1.15, but that was the only bright spot. The Red Sox only mustered five hits and the Royals struck for three runs across the fifth and sixth innings against Jose Laurez, who allowed all three earned runs on four hits, with a walk and strikeout each. The Red Sox got their revenge in the afternoon portion of the doubleheader, earning a shutout of their own. Yoelvis Guedes delivered six one-hit innings with a walk and five strikeouts, while Osvaldo De La Rosa finished it off with two hits in the seventh along with a strikeout. Ceddanne Rafaela had two RBI as part of a perfect 4-for-4 outing, while Fabian Andrade and Carlos Sanchez each had one more. Trailing 6-2 after the top of the sixth, the other DSL squad grabbed five runs in the bottom half to take the comeback victory, doing so after Andres Gari reached on a dropped third strike with two outs. Irvin Villaroel gave up all six runs, four of which were earned, in his 3 1/3-inning start on eight hits, but Robinson Montero was able to right the ship. He pitched the final 3 2/3 innings and did so allowing just four hits to go along with three punchouts. Oscar Rangel led the way offensively with a 3-for-4 morning, bringing home the game-winning run as one of his two RBI. Gabriel Perez and Ronaldo Pulgar each brought in a pair as well. The Cubs scored six runs in the first and kept it rolling as the Red Sox were taken to the woodshed. Jose Ramirez gave up all six of those runs on six hits in just 1/3 of an inning. He walked one and struck out a batter. Despite five walks, Robinson Parra steadied the ship in following him up with 3 2/3 innings of one-run ball, but the damage was done. Yulis Hernandez was 3 for 4, while Oscar Randel and Kleiber Rodriguez each had two more, accounting for seven of the team's eight hits. Player of the Night: Tyler Dearden was a no-doubt choice as he was 3 for 5 with a pair of home runs, his first two of the season, helping to drive in three for Lowell. He upped his slash line to .306/.378/.449. The 2017 29th-round pick now has hits in three of his last five games and has improved his hitting numbers dramatically over his year in the GCL last season.